How to use multiple terminal surface mount chips in amateur project? As you can probably tell from the question I am a beginner in the embedded world. The extent of my experience is some playing around with C and assembly using the Arduino. I'd like to make the jump to the more complex embedded chips that use surface mount device package types rather than through hole device package types. How does one integrate them into an amateur project? Are there breakout boards or CPU sockets for them? I was particularly thinking about Motorola ColdFire devices or ARM Cortex M3 devices. Apologies for the question but I'm somewhat lost by the vast array of devices on offer and just need a starting point really. Soldering the parts takes some exercise. You may want parts with a 0.8mm pitch instead of the higher density 0.5mm pitch. The latter you'll find mostly on devices with 48 pins or more. The other option is that you design your own boards for which you need an EDA (Elecronic Design Automation) package like Eagle. This has a free version with limitations, or a full version which has to be payed for. This design has a long learning curve. When you designed stuff this way you have to option of etching your own board or have it produced by a PCB production shop. The latter is the best choice for quality, the DIY is cheaper and faster. For starters I recommend the adapter boards I mentioned at the beginning of this answer. Most manufacturers offer development kits for their various families. 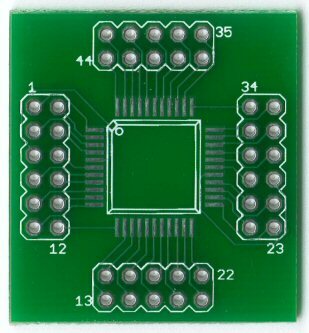 They often also have a blank, 0.1" pitch plate via area for DIP as well as a few common SMD pads for prototyping. The ET-STM32 Stamp is one example; a great kit is the LPCXpresso - make sure you get the right one, as there are two: one -M0 and one -M3(LPC1343). generic SMD-to-PTH adapters, as stevenvh mentioned. For example, it seems that lots of microcontrollers come in a 44-pin TQFP package; you can solder any one of them to a generic 44-pin TQFP-to-PTH adapter. A few of them are "breadboard compatible". Alas, this usually requires you to find someone capable of doing this soldering. "breadboard compatible" plug-in modules that come with a CPU already soldered to it, pins that plug directly into a breadboard, and perhaps also including a crystal and a program-download header and a few other parts. See https://electronics.stackexchange.com/questions/5658/searching-for-atmel-arm-mcu-in-a-breadboard-setup-like-arduino-nano-but-obvio . Sparkfun sells a bunch of breakout boards with other complex non-CPU surface-mount chips soldered to them. "demo boards" with a CPU already soldered to it and a few other parts, often including some kind of connector for connecting your other parts to it. There are many ARM demo boards. There seem to be quite a few projects standardizing on the "Arduino" form factor and upgrading to a more powerful processor. I see the ARMmite PRO, Cortino, FEZ Domino, Maple boards, and netduino all use some kind of ARM processor in a Arduino form factor. Yes, the vast array of devices is pretty overwhelming. Things have sure changed from the day where, if you wanted a CPU for less than $100, you had one and only one "choice". Not the answer you're looking for? Browse other questions tagged surface-mount integrated-circuit or ask your own question. how to use SOP ICs on Breadboard? How do I solder a surface mount (smd) voltage regulator? How does this surface mount coin cell holder work? Surface Mount package standards guide?